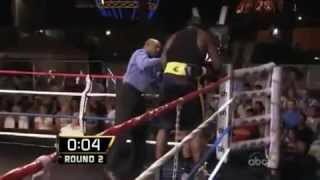 Shaquille O'Neal vs. Oscar De La Hoya - Part 1 from "Shaq Vs"
Ring legend Oscar de la Hoya won a five round decision over hoops legend Shaquille O' Neal in a five-round boxing exhibition before a star-studded crowd at Planet Hollywood in Las Vegas. The bout took place on the latest installment of "Shaq VS," the new ABC series starring NBA superstar Shaquille O' Neal. Shaq, who coined himself "Manny Shaqquiao" for the exhibition, got boxing tips from Hall of Fame trainer Freddie Roach while "The Golden Boy" was trained by Bernard "The Executioner" Hopkins. Hall of Fame Referee Richard Steele was the Official in charge. Shaq vs DelaHoya Non Stop Boxing ... boxing legend Oscar De La Hoya, ... 09-08-2009, 06:16 PM Fighting Cougar. Oscar De La Hoya V Arturo Gatti Full Fight. ... Shaq Vs Oscar De La Hoya Part 1 September 8, 2009 . ... Arturo Gatti Vs Micky Ward La Pelea Del Siglo . Shaquille O'Neal vs Ben Roethlisberger.